​The onset of pneumomia in pigs is fairly sudden. Most mature pigs that have acclimated to their surroundings don't typically get pneumomia unless exposed to a new organism. If prompt treatment isn't given, there is a 10-15% mortality rate for those pigs who are not immune or vaccinated. Of all the diseases affecting growing pigs, chronic respiratory disease is most common. Not only is it common, it's extremely hard to identify early on therefore difficult to control and prevent as well. The onset of the swine flu is usually sudden and affects most pigs across the board and is typically how the pathogen enters the body leading to pneumomia. Growth rates and feed intake are both usually affected by this illness. Some may show signs, others may not. Some of the classic signs are coughing, rapid breathing, dehydration, inappetence (not wanting to eat or drink), discharges from the eyes, fever, poor circulation, sometimes even presenting a blue color indicating lack of oxygen, dehydration and fever. These aren't the only symptoms that can lead to a diagnosis of pneumomia or the swine flu, but these are the most common. 4. Pathogens, if this is the first exposure to these organisms, there may be a dramatic outbreak if you have more than one pig. Diagnosis is made by clinical presentation, a chest x-Ray can be done to see the pneumomia and which part of the lungs affected, usually a fever is present along with the sudden symptoms (behavior is strange, pig not wanting to eat or drink, lameness, coughing, etc) and blood work can be done to see which medication it is susceptible to and also to identify the specific organism and determine the specific respiratory illness. If your pig is seen and treated early, the prognosis is good that he or she will make a full recovery. There are times when the only sign that your pig is/was ill is death. Some pig mask this illness, as well as others, until they can no longer act "normal". Often times, this is too late and the infection has overcome their system. A full course of antibiotics will be ordered and sometimes medications for the secondary effects like the fever will be used. Penicillin injections are the most common with Banimine being used for the fever as long as the clinical signs don't indicate a reason why it can't be used. 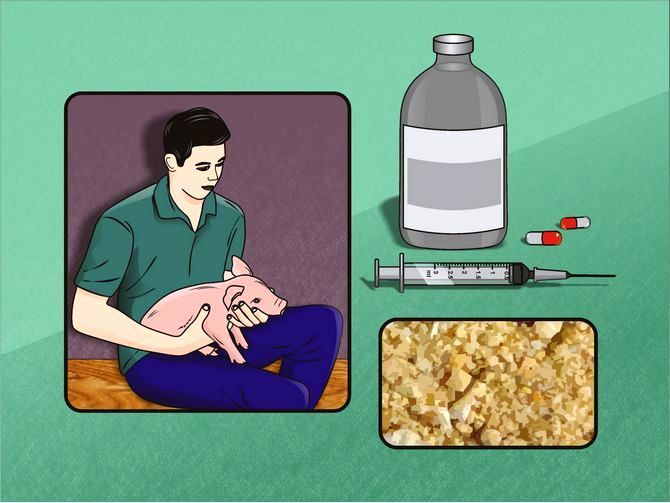 Your pig will likely be too weak to eat or drink without something to help with the fever, and the fever medications used aren't advisable for dehydrated animals. So try and push fluids as much as possible, use a 50/50 mix with fruit juice if you have to.